My friends! I am jumping for joy that it is Friday. It’s been a week and the weekend is a welcome change-up. Recently we toured a model home near by and I shared snippets on my Instastories. Apparently I wasn’t the only one going bananas over this home as I had so many ask me to share more on the blog. So here you are! It’s a stunner. 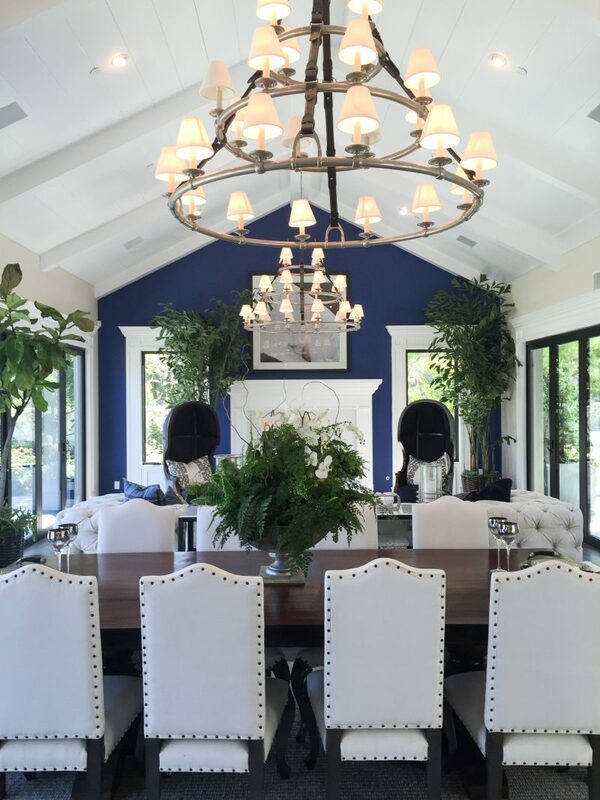 A gorgeous light and bright home tour for this week’s Friday Eye Candy. I love all of the black doors and windows. 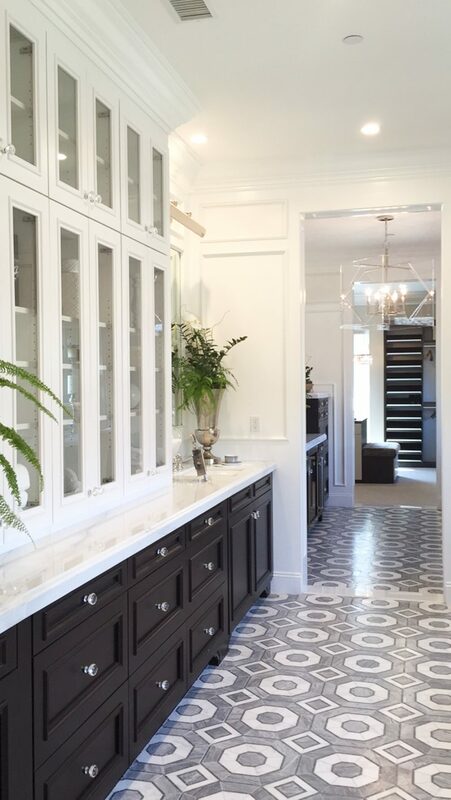 The floors throughout the home are stunning. Quite a welcome as you enter this San Juan Capistrano beauty. The vaulted ceilings, the decor and the room surrounded by windows make this a jaw dropper. This great room opens to the dining space and giant kitchen. 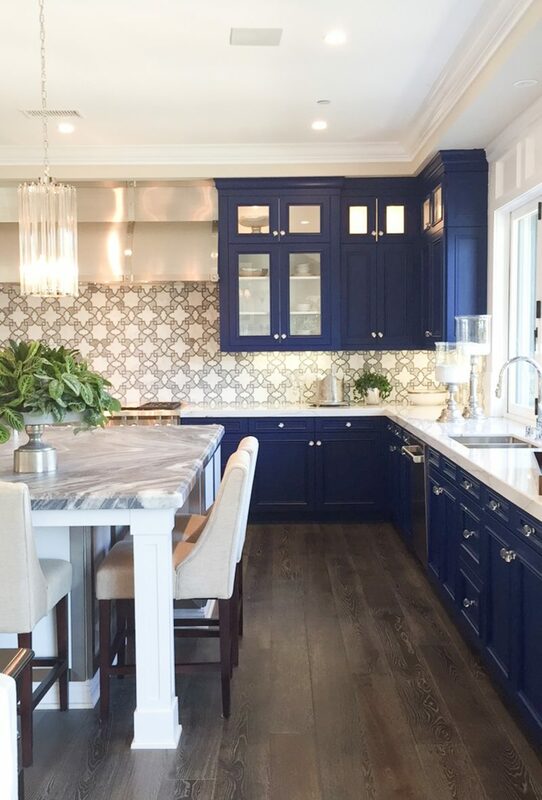 The blue accent wall in the family room ties into the beautiful blue cabinets in the kitchen. 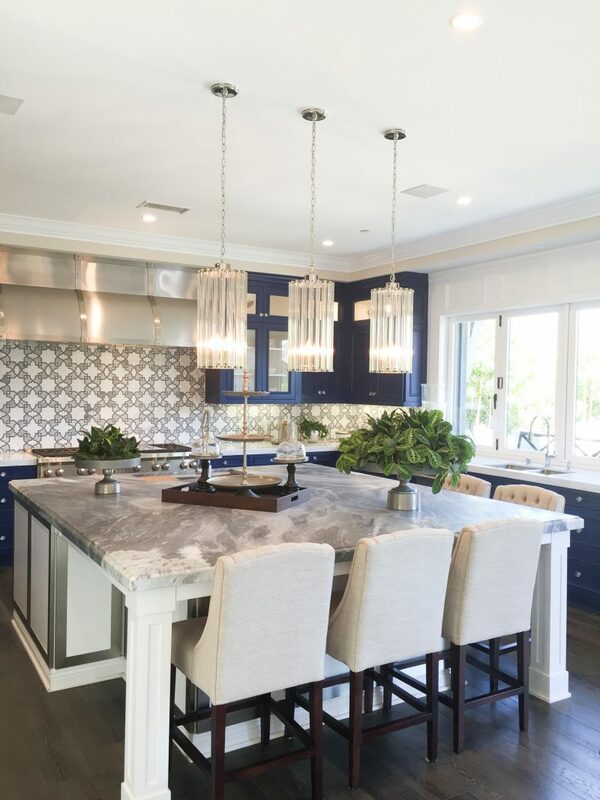 Don’t you feel like you would be an amazing cook when you see kitchens like this?! LOL. I always tell my husband I would instantly be a master chef in here. There is also a chance I might give up cooking all together because I would be too busy sitting at one of those bar stools sipping a glass of wine and staring at this space. It’s truly a toss-up. 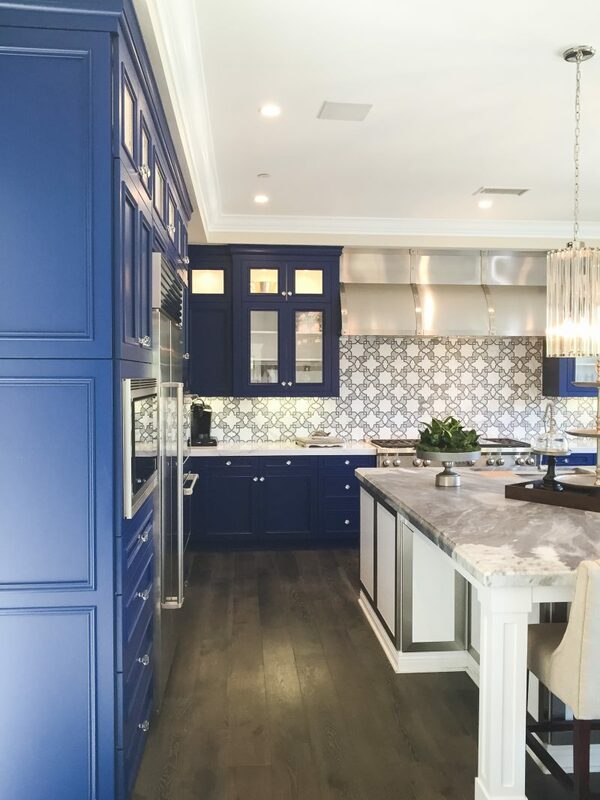 For me, the combination of the tile and the blue cabinets are a home run. Really a stunning combination. 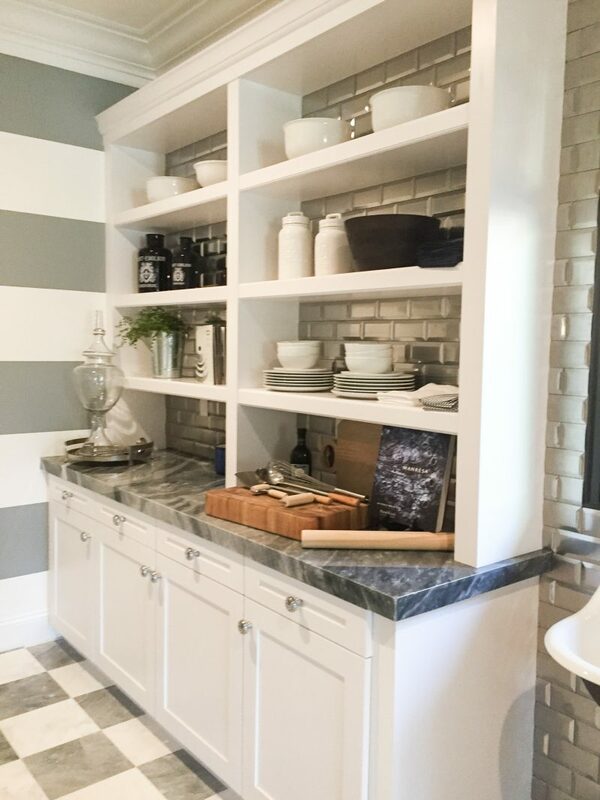 Beyond the kitchen is this butler’s pantry area. It’s complete with TWO sets of washers and dryers. 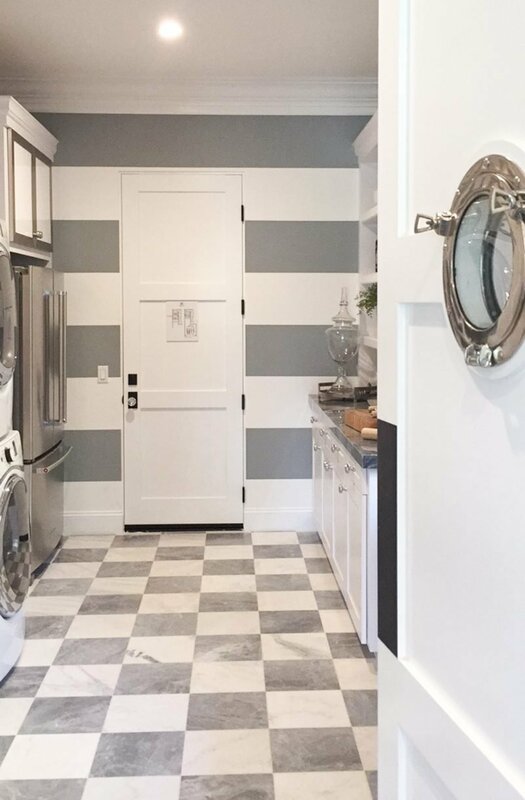 It has a huge sink, a walk in pantry, storage shelves and more. Ummmm. WOW! As you walk up the stairs you are greeted with this beautiful reading nook. 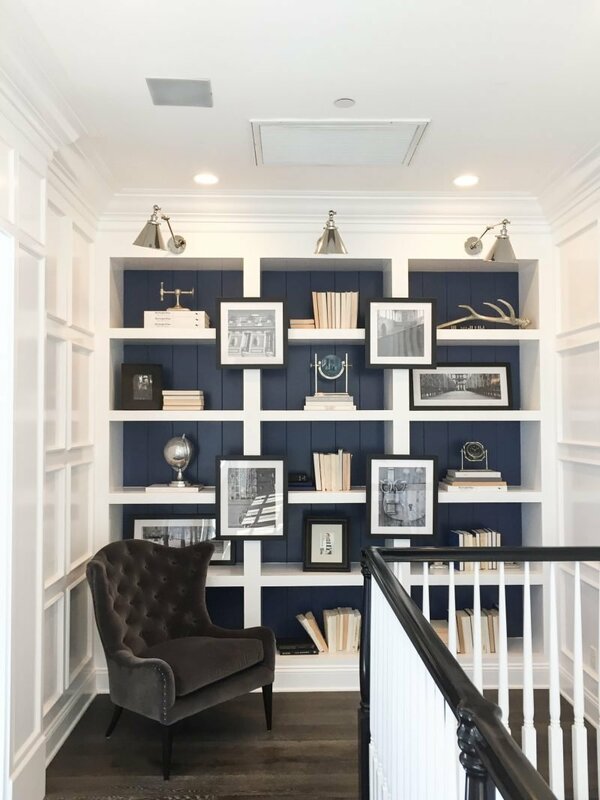 I love the way they tied the blue in and carved out these really pretty shelves. 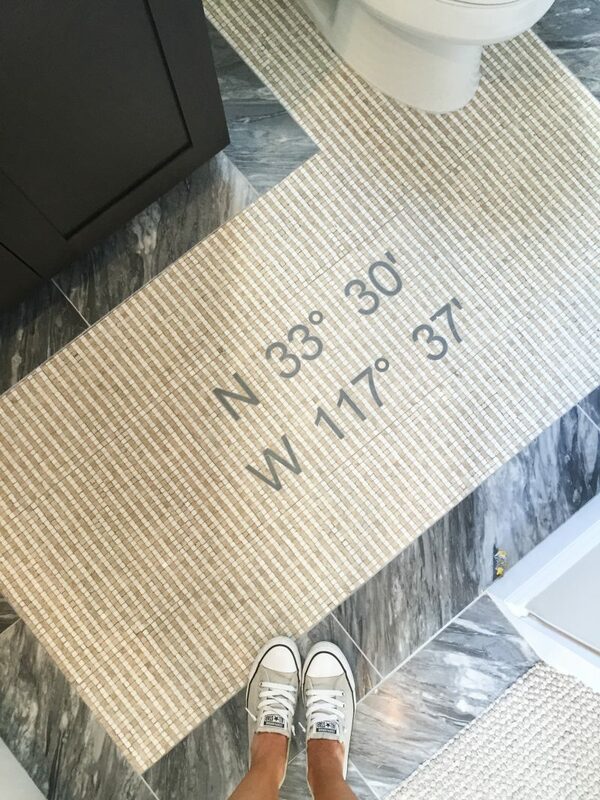 In one of the extra bedrooms the floor had the coordinates tiled into it. This was such a great touch. The bed was also hanging from ropes. My daughter had her eye on a barn door she saw as he dad is about to make her one. Wish us luck on that project. We may or may not have 5-6 unfinished projects in the works. Apparently our follow through has taken a dip. LOOK. AT. THIS. What?! If you saw my Instastories you may have seen that my husband literally couldn’t stop laughing. 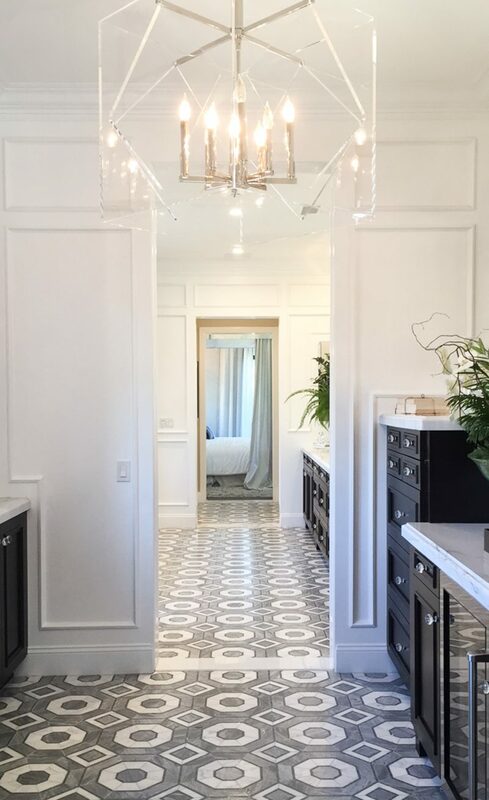 We couldn’t get over the amount of space in this master bathroom. While dreamy and fun to walk through the practical side of me kept thinking, “Hmmmm. This could be two extra bedrooms up here!” You can see the master bed down the hall. From this view, the master bed is behind me and I am looking into the bathroom. This is past the shower. It just goes on and on. 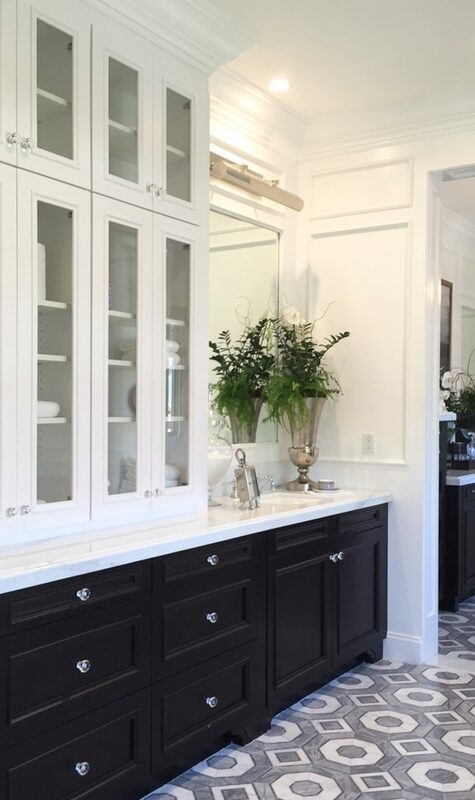 That flooring is so beautiful and I love the black and white cabinets. These are the little things you can pick up on for your own space. No matter how big or small your space may be. All the way at the other end is a huge closet (size of an entire room). I wish I would have snapped more photos outside. This courtyard space is so beautiful. It’s right beyond the black doors I showed you in the beginning of the tour. You would all be invited for a party out here! 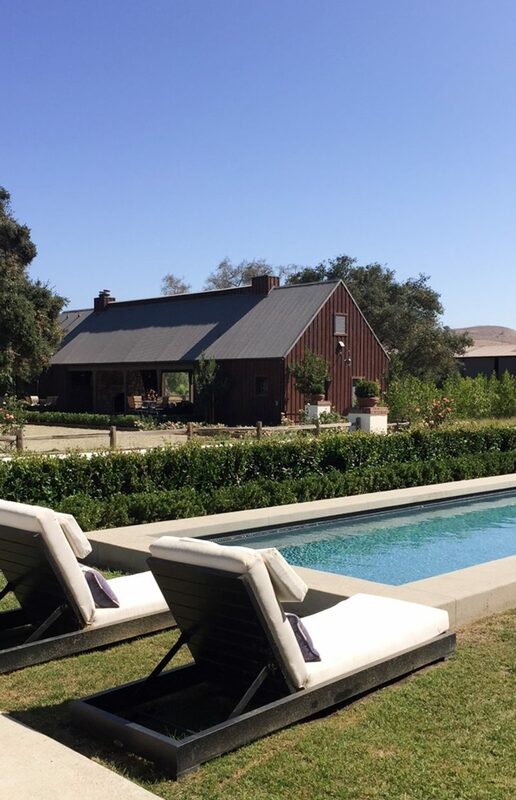 Lastly, the backyard is complete with a lap pool and more entertaining. Oh, and an arena for horseback riding. Yep. There’s that. Truly a unique and gorgeous neighborhood. *Sadly I do not have any sources for paint colors or anything in this home. If you are local, this is the model home from Oak Farms in San Juan Capistrano. This is the only model that still remains open. It is worth walking through. So what did you think? Let me know in the comments below. Have a wonderful Friday, my friends. If it’s your last weekend of summer I hope you take some time to savor it. Off to spend time with my beautiful mom. Sale TipL On an unrelated note, I bought these for $12 yesterday and LOVE. They are oversized and very flattering. These are also an extra 50% off today. I had to size down to a zero. Thought you should know. 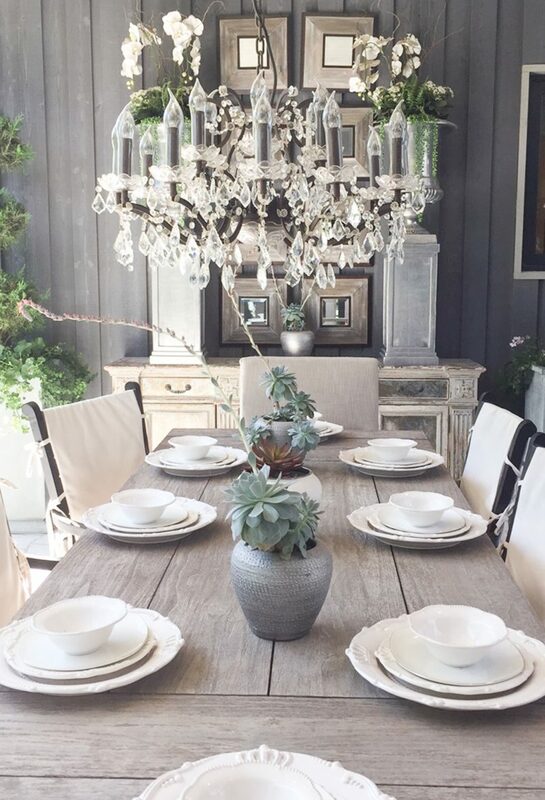 To see snippets of another home we recently toured, head here. Wow, what a stunner! 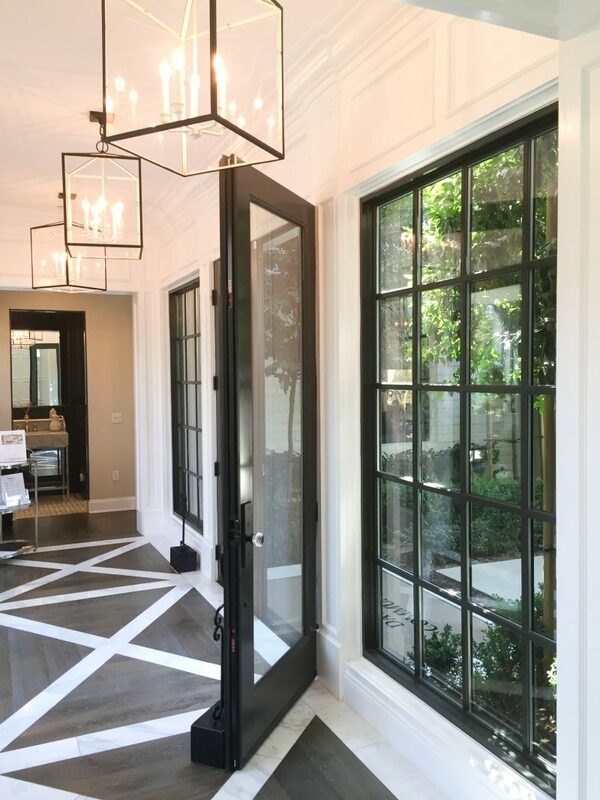 You had me at the (black) door…what a dramatic entrance/exit! So funny! My husband and I were just talking about going to visit this model on Sunday! It looks stunning! I wish I would’ve gone sooner when there were more open! I just finished a little project in my stairwell landing and I’m feeling so pleased with it! I always try and think about what part of my home I’m unhappy with or want to change before going to look at model homes. That way when I go, I can walk away saying, “that was absolutely gorgeous but I’m CONTENT with where we are!” Because, some of those mortgage payments would just be too stressful, and contentment is just priceless, right? Love the dining room chairs. Where can I get more information on them? Thanks for doing that Courtney. It is a beautiful house. I liked the previous one you guys went too also. I can’t remember the name of that one but the bedroom was beautiful in that one. This is incredible! The kitchen has my heart!